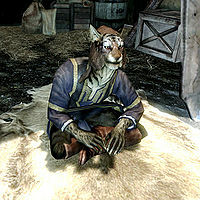 Ma'dran is a Khajiit pawnbroker and the leader of his trade caravan. He travels with Ma'jhad and Ra'zhinda between Windhelm and Solitude. Ma'dran wears a set of merchant clothes and a pair of boots. He is equipped with a steel mace, and carries a selection of upper-class loot and gold. Seeing you as a potential customer, Ma'dran will greet you warmly: "I welcome you, friend. How may I serve you?" You can ask him if the war has made his travels more difficult, to which he will reply: "Quite the opposite, in fact. The soldiers are some of our best customers, for we offer supplies and wares they cannot obtain by other means. It was Ri'saad's idea to come here now, while the land is in turmoil. Where others saw only danger, he saw opportunity." When asked who owns the caravans, he explain, "It is Ri'saad who owns the three trading caravans that travel the roads of Skyrim. Long ago, I was an orphan on the streets of Corinthe. I stowed away aboard a trade ship that brought me here. It was Ri'saad who found me. He provided the funds to start this caravan, and put me in charge of it. I owe him more than I could ever hope to repay." This is the merchandise found in Ma'dran's merchant chest. These items are only available if purchased from the merchant; they cannot be pickpocketed or stolen. They are restocked every two days. This page was last modified on 13 January 2015, at 06:32.